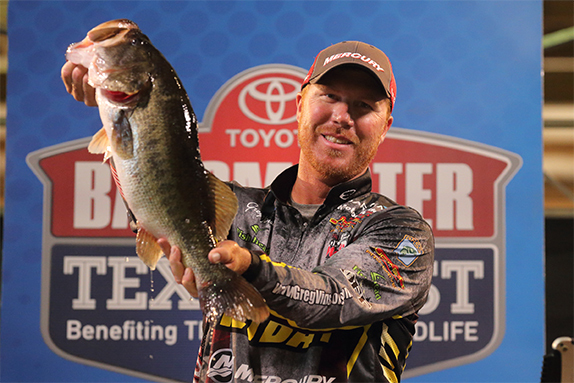 Greg Vinson has finished 38th or better in five of the seven Bassmaster Elite Series events this year. 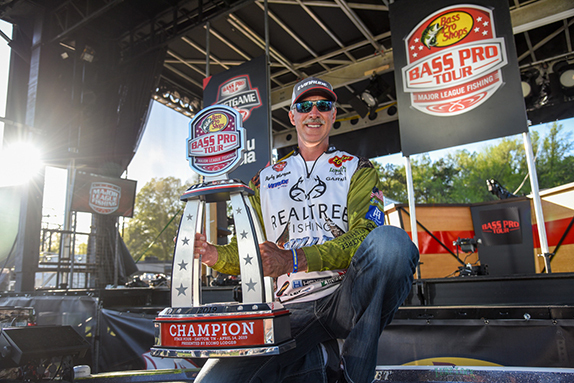 Greg Vinson has experienced his share of sub-par seasons during his 10-year Bassmaster Elite Series career, so an 83rd-place finish in the 2016 Angler of the Year race was nothing earth-shattering. When he followed that up with a 78th-place showing last year, though, he began to wonder whether he still had what it took to compete at bass fishing's top level. He was really in a bad place psychologically after opening the '17 campaign with 109th- and 107th-place finishes over the span of 3 weeks. "My self-confidence after the first two tournaments last year was at an all-time low," he said. "That's one of the big keys to success out here � you've got to be able to have confidence in the decisions you make in order to get the results you're looking for. "Since I made my first Classic (in 2011), I'd never missed two in a row. Having to eat it 2 years straight, I did start to wonder if I was losing something or if the competition was running off and leaving me behind. I've fought that (mental) battle so many times during my career, but never more than last year." He's straightened things out once again, however. He's 17th in the year's points race � the same position where he concluded the 2015 season prior to his 2-year downtick. Interestingly, his bounce-back has occurred despite a disappointing showing in the season opener. 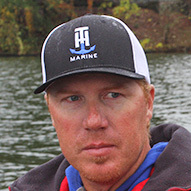 The red-headed Alabamian known as "the Rooster" basically grew up on Lake Martin and he was eagerly looking forward to starting the season there. Things didn't work out as he'd hoped, though � he finished 67th and made the short drive home after day 2 with no paycheck. "I had high hopes for that event and I fished it to win," he said. "That might sound unbelievable when I didn't even make the cut, but I took some chances there that I wouldn't have at other places. I just didn't get the bites on those 2 days." After that, he had a layoff of 2 1/2 months as B.A.S.S.' 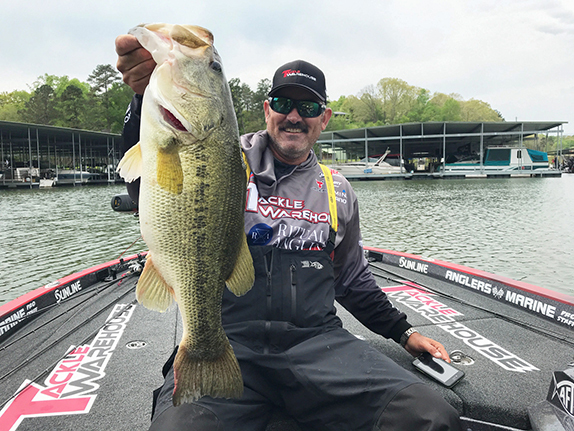 focus shifted to the Classic at South Carolina's Lake Hartwell, and then the Sabine River event, scheduled for early April, was postponed for 2 months due to flooding in southeastern Texas. During the break, he was able to help 6-year-old son Gage get started with his first season of Little League baseball and generally just got away from the stress created by his prolonged slump. "I took a step back from everything and tried to appreciate how far I'd come and the opportunity I had in front of me on the Elites." 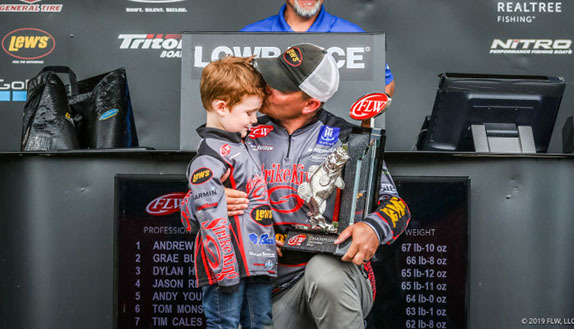 He went to Oklahoma's Grand Lake in late April thinking he could turn things around, and that's precisely what happened as he posted a 7th-place finish. "That one suited my style and I thought I should do well," he said. "When I did do well, it was a big boost for my confidence. "I'm a pretty good late pre-spawn and spawn angler � when the fish are up shallow and you have to predict their movements from day to day, that's one of the things I consider a strength." Vinson followed up Grand with four straight finishes of 38th or better. He sat at No. 8 in the points heading into last month's derby at Lake Oahe, where he turned in his only true bomb of the campaign (86th). Assuming that B.A.S.S. reschedules the postponed Chesapeake Bay tournament, he'll need only a couple of decent finishes over the final three outings (including the AOY Championship tournament) to qualify for his fifth Classic. "It would be the sweetest one yet, for sure," he said. "After the battles I fought for the last couple years and feeling like I'd hit rock-bottom and couldn't get anything right, it'd be great to come back and show that I've still got it." Depending on B.A.S.S.' decision about the Chesapeake, his next opportunity will likely be the St. Lawrence River late this month. He's competed there three times and was 21st on his initial visit, but has since turned in finishes of 72nd and 82nd. "The last two times there I've had one good day and one bad day and I've come up a little short," he said. "But each time I've learned more about it and hopefully I can build off that experience and refine things and be a little more consistent this time." > Vinson said he didn't have strong feelings either way about the Chesapeake postponement. "I was kind of indifferent about it," he said. "I was ready to go if I'd had to. It was a brutal practice as far as getting bites, but I think I had something that could've gotten me through the tournament. I may have to start from scratch if and when we go back." "My dad � he's the one who got me started." "I like to fish for other species and hunt." "Being a former athlete (college baseball player), it's a way to mesh my love for competition with my passion for the outdoors."